The melting away of winter signals a transition to outdoor living where your patio can become a place for meals, reading, coffee breaks, and entertaining from spring to early fall. Take inspiration from these images to build a space suited to your lifestyle, whether it’s outfitted with a bistro set for al fresco breakfasts, a fireplace for evening relaxation or couches to seat multiple guests. While we don't all have this breathtaking view of nature from our backyard, the beauty of a patio is that it provides the opportunity to create a space all your own--the ambiance and design is up to you. While this patio area would be plenty enjoyable without the fencing, it does take it to the next level, while even adding some privacy. Play around with different building materials to make your patio stand out and become a destination within the space of your yard. A hammock is quintessential patio furniture, and the perfect place to enjoy a warm weekend without plans. Pair it with glazed floor tiles and tropical plants to feel transported to an exotic vacation. If your patio is more urban than tropical, make the most of it by sticking to simple lines and clean finishes that imitate and compliment your concrete jungle. No-fuss seating, a glass table top, and a single plant will keep your mind so calm you may not hear the traffic several feet away. You don’t need a lot of material things to outfit your patio--simply decorate with plants for maximum impact. Use a variety of shapes, sizes, and textures to create a garden area that the birds and butterflies will enjoy as much as you. Like the chandelier in the first image, it doesn’t take much to make a patio feel like an extension of your home. We often think of using a fireplace only in the midst of winter, but the flames invite you to linger on a spring evening even if there’s a cool breeze. As the adage goes, more is more. 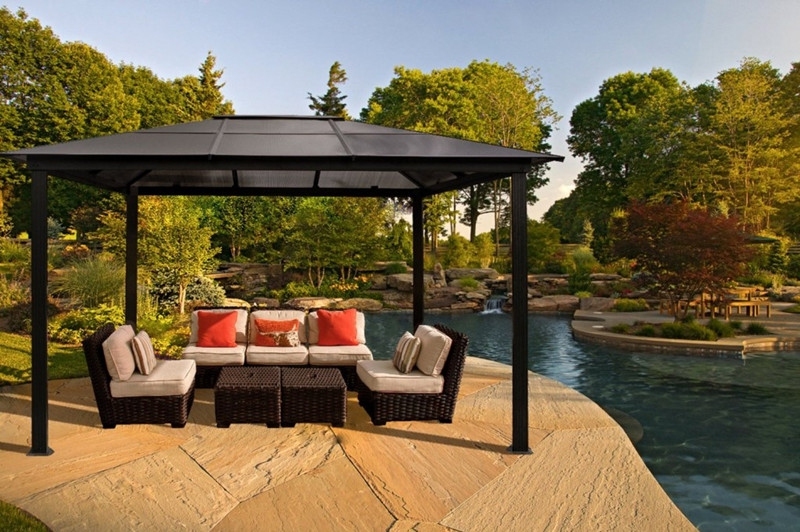 So if you have the space, why not create several patio areas? A single bench in one invites a solitary visitor, while a dining set in another is perfect for a crowd. The empty space creates room for possibility when entertaining--think a bar or table full of food. Think about how your patio area could serve multiple purposes. Here, the retaining wall doubles as built-in seating around a fire pit, which is a solution if you’re short on space or don’t want furniture cluttering the area. Server responsed at: 04/18/2019 8:58 p.m.